Full disclosure: Due to my enthusiastic tweeting and parent communication of my class' use of the FREE elements of VocabularySpellingCity, the site reached out to me and offered my students a free premium membership for the upcoming year. I was not asked by the site to blog about it or sing its praises in exchange for this membership ($49.99). I think the site has a lot to offer and I think other teachers and students can benefit from using it. I discovered VocabularySpellingCity quite by accident. I had to retrieve the lower grade's COW (Computers on Wheels) from the 3rd grade teacher who had used the laptops earlier in the morning. While trying to navigate the mammoth and ridiculously hard to steer cart, I noticed a personalized student certificate laying on top. The certificate congratulated the student for their achievement on a recent spelling test and indicated the number and percentage of words that the student spelled correctly. In the corner was the VocabularySpellingCity logo and address. That was all I needed to start exploring. 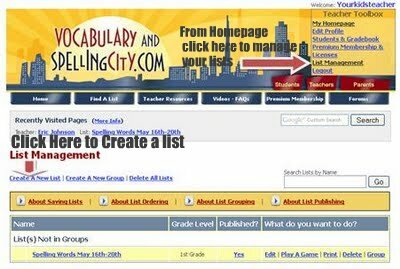 Nancy, from VocabularySpellingCity describes the site as "a free educational website that allows teachers and parents to register, enter, and save their student's own word lists that the students can then use to play a variety of fun, interactive learning games." Registration is easy and free, only requiring an email and some school information that helps users find their class' list later on. Once registered, a teacher can create a custom message to their students and parents, welcoming them to the class' lists. List creation is simple. You can easily add word spaces individually, by 5's or 10's. Provide a name, description, pick a grade level for your list and enter the words in the field individually or in a batch with the words separated by commas. Once all the words are entered, the teacher can choose to have the list displayed as entered, random, or in alphabetical order. The site sorts them automatically. Be sure to 'publish' your list so that it appears on your page and can be searchable. The next step, Word & Sentence Identification, is a really nice feature of the site. The site allows the teacher to choose the word's definition and usage in a sentence. The site also allows sentences to be customized so that they can match lessons or vocabulary usage in the classroom. For example, you might be teaching homophones during the week, you could chose or create sentences that make the lessons clearer or to help struggling students. Once you have a list created, students can practice words and meanings through a great variety of activities and games. I always have my students start with the teach me feature. The 'Teach Me' feature not only displays the spelling word letter by letter as its dictated by a real person, it then uses the word in a sentence. The student can review the word (by clicking on it) as many times as they wish, or can advance to the next word. The student chooses the pace for their learning. A teacher can use the 'Teach Me' feature a number of ways. For handwriting practice, I had the computer dictate the word as the students wrote the word as it was said. Free activities include Match-it, Which Word, Word Search, Alphabetize, and our class' favorite HangMouse, a hangman-like game in which the student try to guess the correct letter before the cat catches the mouse. Premium games include Vocabulary testing, Word-O-Rama, Letter Fall (lots of fun! ), and Speedy Speller that supplements your regular keyboarding practice. (I also used BBC Dance Mat Typing quite a bit last year). The 'Test Me' feature scores student tests and stores them by student id.The speller can review which words they missed and receive a Certificate issued by Miss Write and John Spellcheck. Neat! A Premium membership ($49.99) gives your students access to premium game activities, flash cards, and expanded vocabulary features. The biggest benefits of a Premium membership might be its unlimited list management feature and the automated student record keeping. These features allow a teacher to save paper resources and precious time. The site also does a great job at generating special holiday and content area (St Patrick's Day, science, math, etc) word lists that adds some fun into the usual spelling routine. The site's Teacher Resources section has a lot of resources that helps further student learning. Included in this section is the Teacher forum, an area to share ideas and share class lists that can save a teacher even more time.